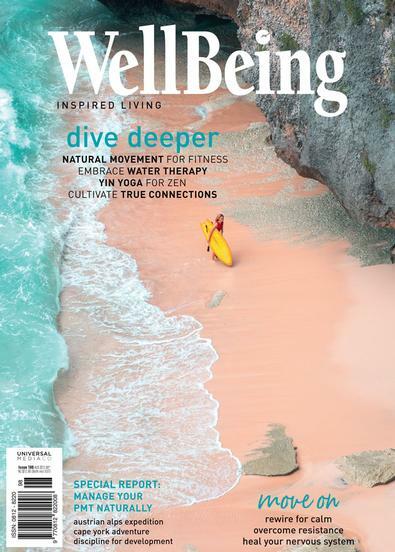 Subscribe to WellBeing magazine for 6 months & save 31% off! Created at a time when healing through food, environmental awareness, sustainable living and holistic medicine were fringe concepts, WellBeing was a magazine that grew and flourished -celebrating and encouraging personal and planetary health. Today it is categorically, one of Australia’s most trusted and respected natural health and lifestyle magazines, continuing its vision to inspire, educate and enlighten, as ideas such as self-nurturing, reflection, sustainability, organic produce and natural therapies become more mainstream. Within every issue you’ll discover well-researched, thoughtful articles written by top industry experts that offer practical information, tips and advice – beauty and health, body, mind and spirit, home, parenting and relationships, planet and travel. So find your quiet corner and enjoy the space to reflect – something special awaits. This is by far the best magazine I have ever read. Very inspiring with great information. Excellent publication, full of fantastic health advice, nutrition and tips, its my favourite magazine! Have been a subscriber of this magazine for a number of years now. Soul-nourishing, informative, inspiring and engaging on many levels- a wealth of spiritual, nutritional, psychological insight. I look forward to this and savour reading Wellbeing every time! This is mag is my treat to myself. I always feel refreshed nd ispired after reading. Always good articles too. I love this mag! Love the new cover - sign me up! My Naturopathy teacher recommended Wellbeing to me. I love it!!!!!! Wellbeing has the best information and is totally inspiring for anyone who is working or studying in the natural health field. Thank you Wellbeing!